Lo wandered over and stood in front of the mirror, pulling her hair back tight to expose her taut forehead with its mottled ring of silver freckles. 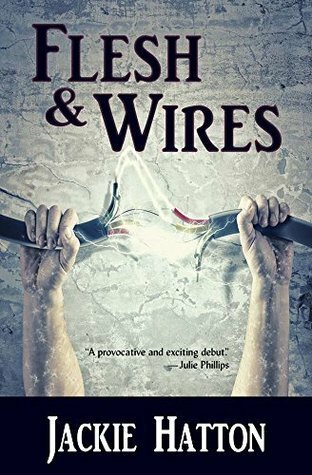 The wires have allowed the women to survive but survival has come at a high price. The social commentary that underpins Flesh and Wires is what does it for me. So yay for the wired women who now rule the Earth. Yay for their portrayal as women who never age and the heartbreak that implies. And yay for Jackie Hatton, hard at work on her second novel, coming to a bookstore near you!